WANDA BENATTI IS A FREELANCE GLASS ARTIST. 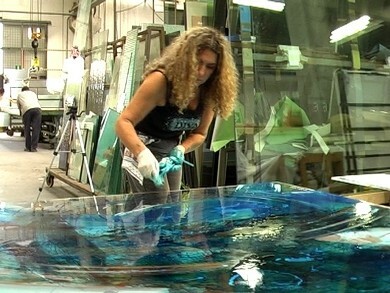 SINCE 1992 SHE HAS BEEN WORKING BOTH AS A PAINTER AND A DESIGNER AND PERFORMER OF EXCLUSIVE ARTISTIC STAINED GLASS, ABOUT WHICH A PHOTOGRAPHIC DOCUMENTATION IS PRESERVED IN SWITZERLAND (MUSEUM OF STAINED GLASS, ROMONT). SHE HAS BEEN COLLABORATING FOR YEARS WITH ARCHITECTS AND INTERIOR DECORATORS AS THE SOLE AUTHOR AND EXECUTOR OF ARTISTIC STAINED GLASS. HER STAINED GLASS WINDOWS AND PAINTINGS ARE PRESENT IN MANY PUBLIC INSTITUTIONS, BANKS AND PRIVATE COLLECTIONS. Mixed techniques on glass with engraving at different depths, cold murrines and paintings with specific materials. Utilization of laminated or tempered or monolithic glass of various thicknesses on: shutters, tiles, fixed and sliding panels, parapets, walking surfaces, false ceilings, tables, etc.